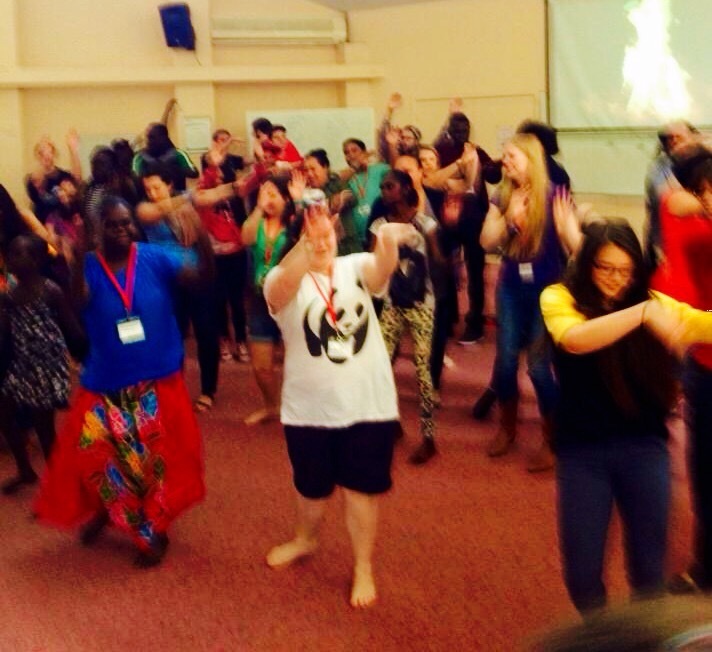 I was helping to lead the closing worship at the National Young Adult Leaders’ Conference in Sydney last year. My tasks were to present a Bible study and lead the celebration of the Lord’s Supper. Someone tweeted “Prez @AndrewDutney just called #NYALC a holy shambles. Not sure if I’m offended or proud…” When I saw it (after worship had ended) I tweeted the reply, “It was definitely intended with reverence and love”. There was no denying it; “holy shambles” was exactly the term I used to describe the event I was part of. But as those words formed in my mind it was with a sense of wonder and joy. I sent my buttoned up, liturgical/theological critic self to take a nap or something and accepted the opportunity to be in this good moment, with these good people, to worship the God we all loved. There was a bit of singing, a bit more dancing, some prayerful conversations in pairs and small groups, a few Bible readings, testimonies from those who wanted to share them, several awkward pauses while we worked out what was to happen next or how to get a piece of technology to work and, as I mentioned, a Bible study followed by an extemporised celebration of the Lord’s Supper. It took us all morning. The small group that had done the planning had a running sheet, but that didn’t seem to have much bearing on what was actually going on. The instructions I was given changed several times before worship began and a few more times while it proceeded – as we all adjusted to the unfolding event. It was truly a shambles and it was truly holy – and I felt privileged and blessed to be part of it. This has been something of a journey for me. Like many young worship leaders I began my ministry anxious about “getting the liturgy right” (Joint Liturgical Group, 1982). Although I never doubted there was more than one way to worship God I also assumed that there were “essentials” without which even the best words, music, art and action did not count as worship. Beginning. Middle. End. Celebrate that story in whatever language and with whatever words are appropriate to the worshipping community; read or extemporised. Enter into that story using whatever music, movement or media throws light on it. Find the connections between that story and the lives and world of the worshipping community. Because in the celebration of that story Christ “reaches out to command people’s attention and awaken faith; he calls people into the fellowship of his sufferings, to be the disciples of a crucified Lord; in his own strange way Christ constitutes, rules and renews them as his Church” (Basis of Union paragraph 4). That story, told in the diverse words and actions of Christian worship, is a means of grace. And since its formation in 1977, the Uniting Church has accommodated an increasing diversity of worship practice in the effort to make that means of grace accessible. That is the purpose of “ordered liberty”. In 35 years of ministry I’ve become pretty confident about leading diverse communities in a variety of styles of worship, according to the principles of “ordered liberty” – ensuring that the “essential” elements of each service are included so that the community is nourished on a “full diet” of worship (National Working Group on Worship, 2005, pp. 13-14). But in two and a half years as President I’ve been fed on a “diet” that has gone well beyond “full” and would better described as rich and spicy. It included finding that “prayer meeting” doesn’t necessarily refer to a handful of people seated in a circle in a closed room with heads bowed and eyes closed. When our Sudanese congregations hear “prayer meeting” they assume we’re talking about hundreds of people, up all night singing, dancing, drumming and pouring out their hearts before God. It included learning to negotiate the unfamiliar formalism of relationships between minister and people, men and women, elders and young adults in our Fijian, Tongan or Samoan worshipping communities, at the same time as entering into their passionate singing, praying, fasting, preaching, dancing and feasting. 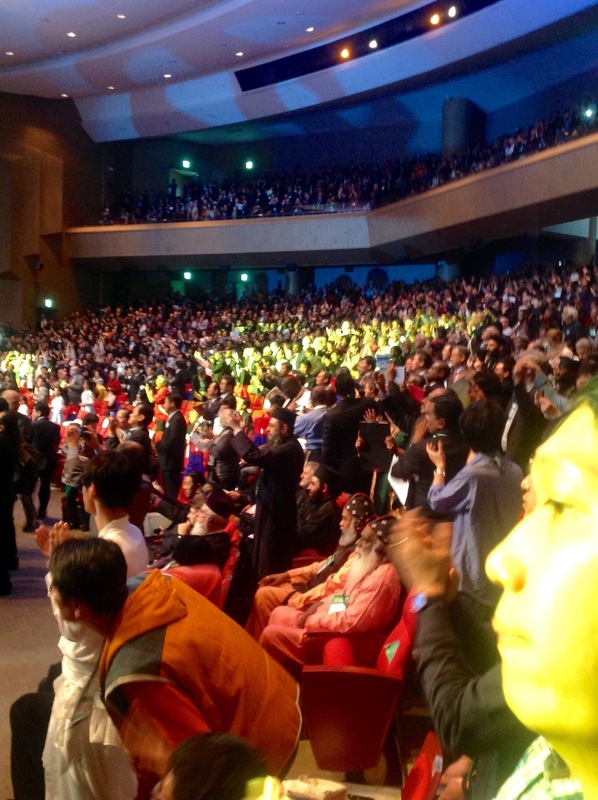 There was my first exposure to “vocal prayer” in huge Protestant congregations in Korea. 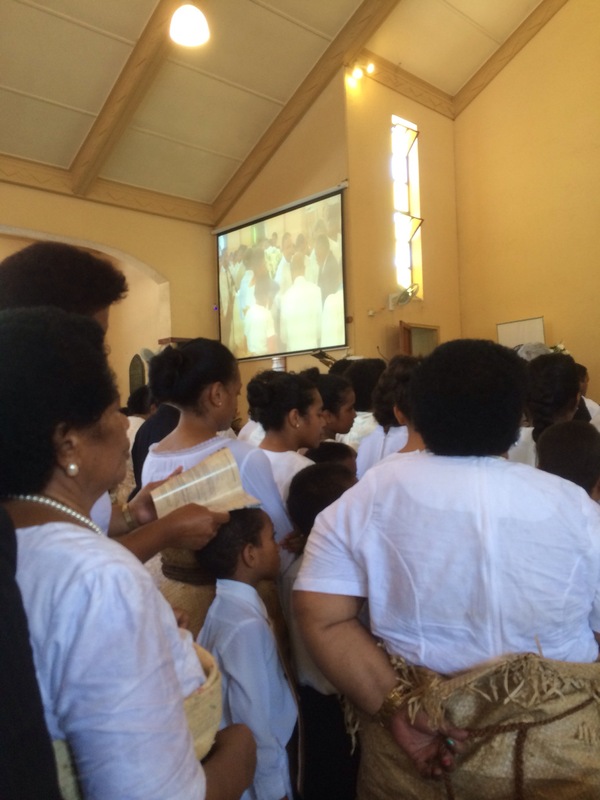 There was the spontaneous, irrepressible singing and dancing of the Cook Islands Christian Church. (The CICC has no choirs as such. It’s all choir!) 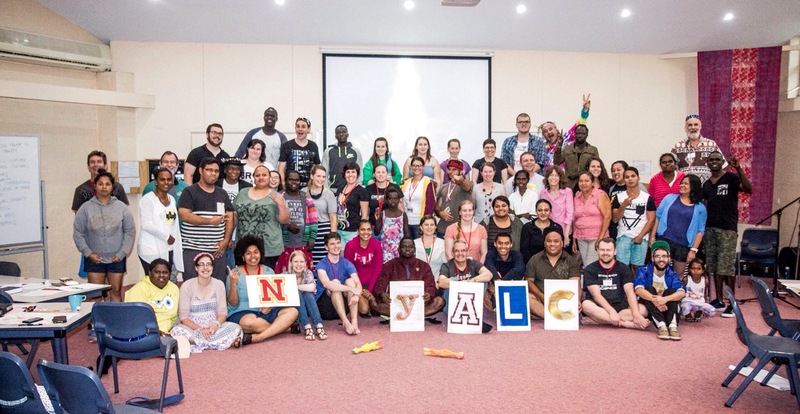 And there were several experiences of worshipping with the Uniting Aboriginal and Islander Christian Congress and their heady mix of old-time Gospel, Pentecostalism, country music and radical politics – largely unstructured, highly participatory, multi-generational, lots of stories, laughter and a few tears. UAICC worship isn’t led by the head or the clock but by the heart and the Spirit. It takes as long as it takes and includes whatever it needs to include as the community brings its suffering, loss and grief to God who they experience as reaching out to them in love. Sometimes I could identify the “essentials” in what I was experiencing but, frankly, just as often I could not. And the effort of trying to do so was not only a distraction from participating in the community’s worship but also disrespectful of that community and what the Holy Spirit was doing among and through them. For a growing minority of Uniting Church congregations, the principles of “ordered liberty” are an inadequate, inappropriate description of their worship. That’s not to say we should ignore the accumulated wisdom of the church about the “essence” of Christian worship. But we need to acknowledge that “ordered liberty” tells only part of the story. Something further need to be said about what is “essential”; something that has been exemplified for me in the diversity of congregational worship I have experienced during my term as President. And an outstanding example of this was the “holy shambles” of NYALC’s closing worship. I was content and grateful. Joint Liturgical Group, 1982. Getting the Liturgy Right: Practical Liturgical Principles for Today. London: SPCK. National Working Group on Worship, 2005. Uniting in Worship 2. Sydney: Uniting Church Press. Worship Working Group, 2012. The Nature of Christian Worship: Including a Consideration of Contemporary and Alternative Worship. In: Building on the Basis: Papers from the Uniting Church in Australia Assembly Working Groups on Doctrine and Worship 2000-2011. Sydney: The Assembly of the Uniting Church in Australia, pp. 229-235. Previous What happened on Thursday morning?